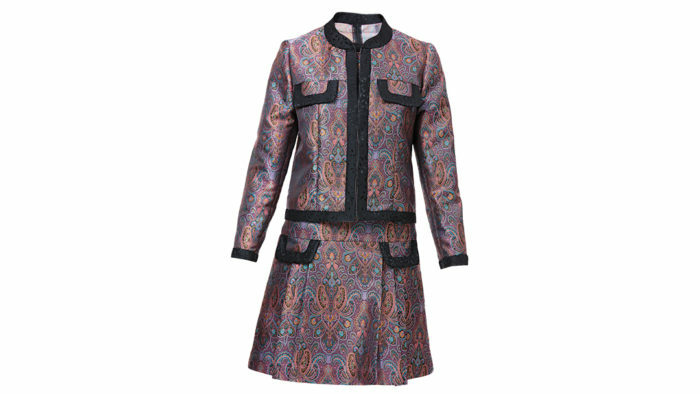 This dress and jacket have intriguing details that present interesting sewing challenges. The jacket, 3840, has a band collar, front yoke, pocket flaps, front panel seams, abutted front opening edges, two-piece sleeves, and back princess seams. The front edges, hemline, flaps for faux breast pockets, and sleeve hems are trimmed with 1-3⁄8-inch-wide bands. The dress, 3841, is semifitted with a banded jewel neckline, center-back zipper closure, and front dropped-waist seam. Four sunburst tucks radiate from the neckline band at center front. The skirt has three knife pleats on each side front. The waist seam can be trimmed with a contrasting band or include flaps for faux pockets. 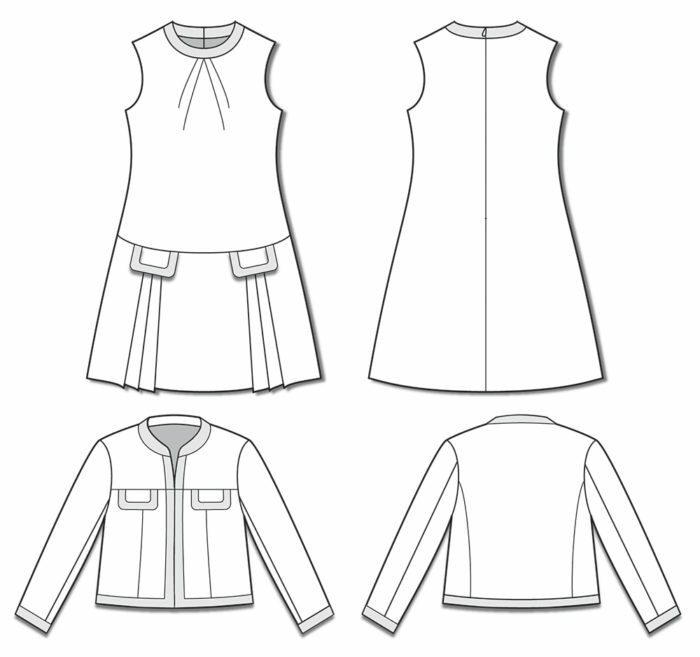 Marfy patterns are cut to one size and include no instructions, illustrations, or seam or hem allowances. The patterns do not include pattern pieces for the bands; our staff seamstress created pattern pieces for the bands and appliquéd them to the garment. This ensemble is best made in wool crepe, tweed, or silk/linen blends. Sewing Tip: Edgestitch the knife pleats’ inner folds to help maintain their crisp line. This review was originally published in Threads #199, Oct./Nov. 2018.